Many quality keyframes have Dome Screws to adjust how the frame rests on the keybed. Most dome screws are adjusted using a tuning hammer or special key. 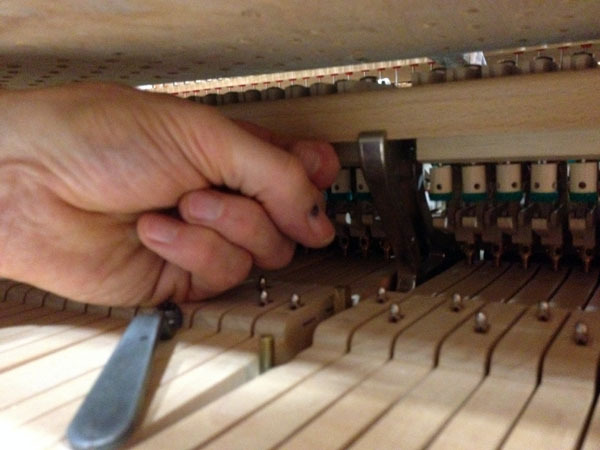 Many Piano People do this on the work bench, using a straight-edge; some draw slips of paper between the dome screw surface and the keybed. Neither of these methods are reliable – or easy. 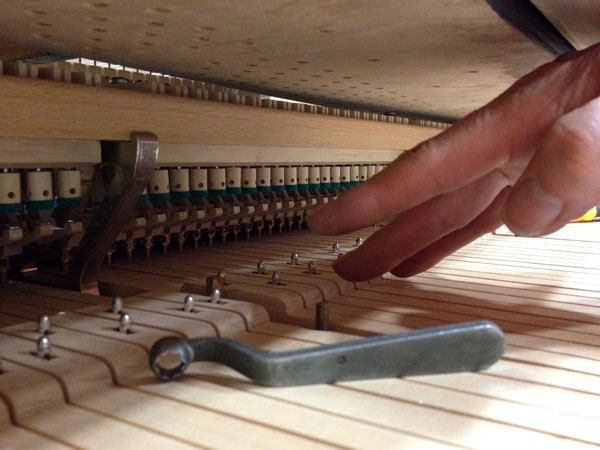 With the keyframe (and full action) in place on the keybed and cheek blocks screwed in position, tap obliquely down onto the key chasings close to each dome screw, lifting the keyframe as you tap (by pulling on the dome screw head or pressing up on the stack – as in the picture of a Bluthner concert grand) until you hear knocking (of the dome screw on the keybed). The aim is to adjust each dome screw so that minimum lifting is required to produce knocking, thus putting as little tension into the keyframe as possible. Adjusting each dome screw may affect its neighbouring screw, so check up and down the keyframe several times. 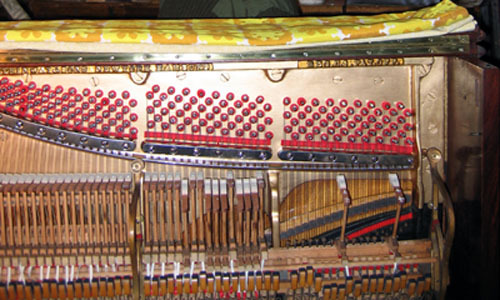 Whereas, if pressing down reveals downward movement of the row of heads, there’s obviously a gap between dome screw and keybed: the screw must be turned down. Keep turning it down until the stack lift+chasing tap produce knocking. Now check neighbouring dome screws. Etc…. Sounds labourious? Once mastered, this method is quick and failsafe.